Kindness Day UK is a nationally recognised day for the celebration of kindness in society and day to day life. Individual acts of kindness are encouraged on this day annually. PLEDGES CAN RANGE FROM AN INDIVIDUAL SMALL AND SIMPLE ACT OF KINDNESS TO AN ORGANISATIONAL PLEDGE INITIATIVE ON ANY LEVEL. Kindness Day UK is celebrated nationwide annually, 13th November. It is a day to celebrate and promote kindness in all its forms. World Kindness Day falls on the same day and unites people in kindness globally. We have been encouraging schools nationwide to take part in Kindness Day UK. Here are some examples of schools who have celebrated the day. The whole school enjoyed taking part in Kindness Day again. It is a helpful way of reinforcing kindness which we then continue to practice throughout the year. For Kindness Day the classes made a Kindness Day Book, paper chains of kindness, kindness kites which ‘chase away the sad grey clouds’. We held an assembly for the whole school. In classes books such as ‘The Kindness Quilt’ were read. Reception each made a kindness quilt (a square decorated with kind words and pictures). Year 1 made the friends paper chain of kind deeds. Year 2 made kindness kites, a kindness book with sub-headings taken from your kindness pack such as ‘kind thought’ or ‘kind acts done by me’. Our lessons have been based on a theme of Kindness - thanks to your materials - and we have had lots going on! We have had wellie walks and wellie wanging for Give Hunger the Boot and we have been raising money with lots of activities like smoothie making etc However, the best bit was the random acts of kindness by our school council Kindness Army when we went into town giving away sweets and flowers and washing cars for free! The reaction around school has been fabulous and so has our community reaction. We have also raised lots of money for charity but, as a school we have been immensely enriched. I have included some of the highlights below and my ode to kindness for our final assembly alongside our totals raised. Thank you so much for the support of Kindness UK - I can see this will be an annual event! All round great week which really showed the kindness of all pupils and staff. I thought Kindness Week was absolutely brilliant! It has been one of the most enjoyable weeks I have experienced in school! It was a pleasure to receive my Kindness postcards from the Kindness army (who are cute beyond words!). The lovely messages from students and staff alike really made my day and put a huge smile on my face! Thank you for Kindness Week! My highlight was the year 8 pupils on Wednesday producing their Victoria sandwich sponges singing the Michael Jackson song "Just beat it" as they were just beating their ingredients, it was magic. 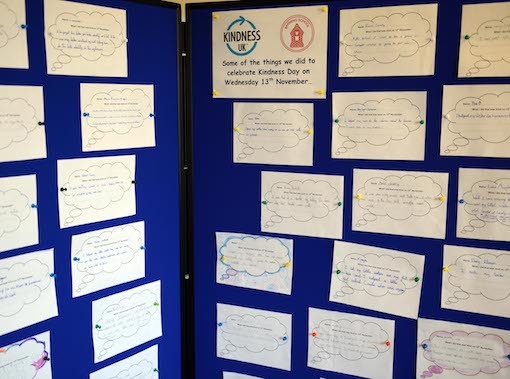 What a fantastic idea of having the kindness postcards - I have really enjoyed the kind comments sent from pupils who have really made my week. The best part was when my friend brought me some Haribo in! Miss Patel gave us all chocolate cupcakes! The best part of kindness week was no homework! We should have more of this! We are launching a fortnight of activities with assemblies on 4 November in both KS1 and KS2 promoting kindness. There will be an art competition: ‘K.I.N.D.N.E.S.S...Find out what it means to me? with prizes for children from Reception Key Stage 1, Lower Key Stage 2 and Upper Key Stage 2. The winners will be announced on the 13th November. Each will have its own Kindness display and the Library Areas will have displays of historical figures who have demonstrated acts of kindness. Each year group will devote some Literacy time to Stories on Kindness and poetry. Every child will have a template of a leaf where they will be able to write an Act of Kindness that they have witnessed or carried out. These will then be attached to a Tree of Kindness. 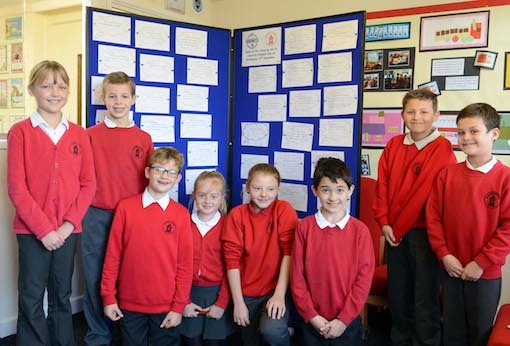 Each Year group will also have a 'Compliment and Thank you board' where every child will have an opportunity to express their gratitude towards each other. After International Kindness day we will have an assembly led by a member from the local salvation Army to encourage the children to bring in goods to create a Christmas hamper. This is the third year that we have carried out this Christmas appeal and it is hoped that the generosity will continue. Our school is about to undergo a lot of building work which will not be completed until March 2015. Between now and then certain designated areas will be Kindness zones. We are not sure where all these activities will take us, but we are excited and hopeful that each term some time will be devoted to celebrating kindness. Barming Primary School, Kent is actively promoting and supporting kindness in school and the local community. We have received a kindness pack and will use the specific ideas within our school as we have just restated our community code and have kindness as our first priority. We also have Peer Mediators trained to work with children on the playground, and have buddied Y6 Children with YR children to help them when they start school. We would like to be come affiliated and have a kind school certificate printed to help show our commitment to visitors/parents. I gave a ‘kindness’ assembly to the whole school on Monday and the challenge for Kindness Day is for all children to do an additional kind thing on the day either at home or school. On Thursday each child will record what they did in a kindness thought bubble. A selection of these will then be displayed in school. We involved the children in Kindness Day and asked them all to try and do an additional kind thing at home or school on the day, following an assembly I ran. 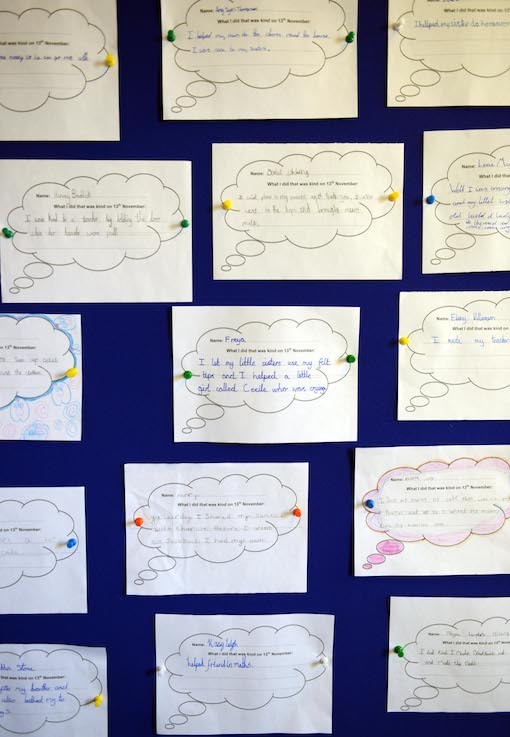 Attached are photos of the display I did of some of their kindness thought bubbles, explaining what they did. It was a very successful day and provoked some good discussion about kindness – I followed up a week later with an assembly about the ‘Random Acts of Kindness’ campaign that Danny Wallace ran. Many thanks for the certificate. I showed the children in assembly and explained why they deserve to have it. It’s now proudly on display right where parents and visitors can see it in our entrance area. Many schools across the country now celebrate Kindness Day UK annually. 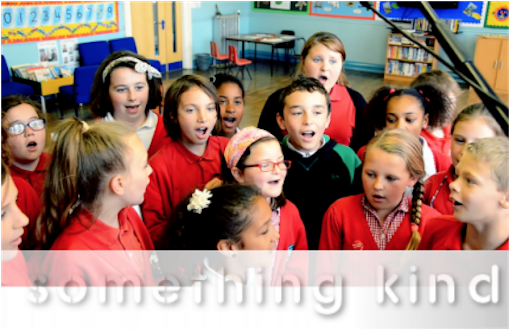 Gotherington Primary School in Gloucestershire is just one example of schools being kind 13th November 2013.